Hinduism has a long tradition in Sri Lanka. Hindus currently make up for 12.60% of the Sri Lankan population, and are almost exclusively Tamils apart from small immigrant communities from India and Pakistan such as the Sindhis, Telugus, Kannadigas and Malayalees. In the 1915 census they made up almost 25% of the population, which included the indentured labourers the British had brought. Due to assimilation, emigration (over 1 million Sri Lankan tamils have left the country since independence), today they are a smaller and still dwindling minority. Hinduism is dominant in the Northeastern province, where there is a significant number of Tamil people. 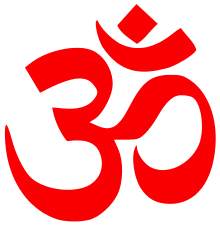 Hinduism is also practised in the central regions (where there are significant numbers of people of Indian Tamil descent) as well as in the capital, Colombo. According to the government census of 2012, there are 2,554,606 Hindus in Sri Lanka. During the Sri Lankan Civil War, many Tamils fled to other countries. There are Hindu temples abroad which were built by the Sri Lankan Tamil diaspora to maintain their religion and culture. 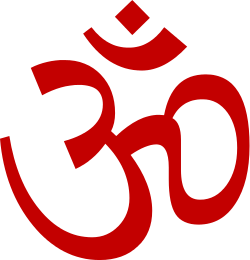 The majority of Sri Lankan Hindus follow the teaching of Shaiva Siddhanta. Sri Lanka is home to the five abodes of Shiva, which are known as Pancha Ishwarams. Murugan is one of the most popular Hindu deity in Sri Lanka. He is not only venerated by the Hindu Tamils but also by Buddhist Sinhalese and aboriginal Veddas. According to legend, Sri Lanka was formed when sage Narada persuaded the God of Wind and Air, Vayu, to humble his close friend, Mount Meru (a huge mountain where the Gods lived). Vayu then spent the next year blowing strong winds at the mountain, which was shielded by Garuda, a mythical bird. When Garuda took respite for a while, Vayu caused part of the apex of the mountain to fall into the sea, forming the island of Sri Lanka. The first major Hindu reference to Sri Lanka is found in the great Hindu epic, the Ramayana. The Ramayana tells that Sri Lanka was ruled by Yaksha king Kubera. The throne of Lanka was usurped by his half-brother Ravana. Ravana was the main villain in the Ramayana and was killed by Rama the avatar of Vishnu. The Ramayana also mentions a bridge between India and Sri Lanka, known as Rama's Bridge, constructed with rocks by Rama with the help of Hanuman and others. Many believers view the sand bar islands connecting Sri Lanka to India as the remains of the bridge as seen in satellite images. Archeological evidence is also found to support worship of Lord Siva in parts of Sri Lanka, from pre-historic times, prior to the arrival of Prince Vijaya. Even Ravana was a devout follower of Lord Siva. Evidence states the earliest inhabitants of the island were the Nagas and Yakkas. The Nagas practiced an early form of Hinduism that worshipped Lord Shiva and serpents. This form of animistic Shaivism is common in Tamil Nadu and other parts of India. The Nagas who inhabited the Jaffna Peninsula were probably the ancestors of Sri Lankan Tamils. The Nagas started in the 3th century BCE to assimilate to Tamil language and culture, and lost their separate identity. [note 1] The Nainativu Nagapooshani Amman Temple in Nainativu is believed to be one of the prominent 64 Shakti Peethams. The arrival of European colonialists brought profound consequences to both Hindu and Buddhist communities. In 1505, a Portuguese fleet, under the command of Captain–major Don Lourenço de Almeida, arrived off the coast of Sri Lanka. Eventually deals were struck between rival native rulers and the Portuguese. Formal treaties between the two groups thereby formerly heralded the entry of the alien forces in the political arena of Sri Lanka. Eventually over time, the Europeans were able to take advantage of the fractured nature of Sri Lankan politics, eventually culminating in successful military wins against the rebellious natives, most notably against the Hindu Tamils in the North, whose leaders were made to swear allegiance to the king of Portugal in return for maintaining their distinct laws and customs. However, any so-called rulers had merely become puppets of their European overlords until in the end, further rebellion caused the Tamil Jaffna Kingdom to fall in the hands of the Portuguese in June 1619, when the incumbent ruler and his family were arrested and taken prisoner. 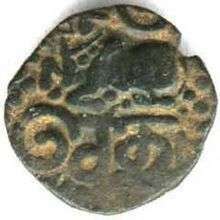 According to the Portuguese administrative arrangements, the jurisdiction of Jaffna came directly under the Viceroy at Goa. In Goa, the deposed ruler was tried for high treason by the Portuguese High Court (Relaco), found him guilty of all charges leveled against him by the Europeans and the ruler was sentenced to death. Ultimately, the last Tamil Hindu king of the Jaffna Kingdom (1215 to 1619) was hanged in the year 1621. While attempting to control their newly-won lands in Asia, the Portuguese were also actively encouraging Hindu Tamils to convert to Catholicism. Force conversion was also practiced. In 1618AD, following some serious Tamil revolts, the Council of the Jesuit Society had resolved that those Tamils who converted to Christianity would be spared of death. Others encouraged to embrace the Catholic creed included the wives and children of murdered Tamil leaders. Tellingly, the surviving three children of the executed Tamil King of Jaffna, had been converted to Catholicism when young and were later sent to Portugal for their studies. The eldest of these children officially signed a declaration form handing over full control of Jaffna to the King of Portugal . This officially ended Tamil sovereignty, in Sri Lanka which began as an invasion in 1215, and permitted Catholic conversion activity in those formerly Tamil areas. The result of these actions explain why there are today Tamil Catholics to be found in Jaffna and surrounding parts. Portuguese were marginally more successful in converting numerically more Tamils of the coastal regions of Both Sri Lanka and India as they were able to intercede on behalf of these fishing communities against the machinations of the Muslim merchant guilds who had monopolized pearling and other trading activities till then. By eliminating the Muslim middlemen, the Portuguese won the loyalty of these people. But further inland their attempts would yield only minimal results. During the British colonial period a large scale attempt to convert Tamil Hindus to Protestantism by American Baptist, Presbyterian missionaries along with British Methodist and Anglican was attempted via building schools and hospices. Again they were only marginally successful. Conversion attempts today by various Muslim, Christian sects, Bahá'ís, and Mormon missionary activity is still ongoing. The ongoing civil war and the recent Tsunami has given further impetus to these efforts. Nevertheless, the vast majority of Sri Lankan Tamils still remain loyal to their ancestral Hindu religion. The elite and the upper classes, consisting of the higher castes, amongst the Tamils adhere to what is known as the Saiva Siddhanta or Dvaita school of Shaivism. Sidanta is opposed to the mainstream Vedanta school of India. Adherents of various Dvaita school both amongst the majority Vaishnavites and minority Shaivites can been seen across India. But amongst Sri Lankan Hindus, it is the Dvaita Siddhanta school of thought that commands elite loyalty. Dvaita Saiva Siddhanta school differentiates between the soul, god and actions or Karma as opposed to the unity of the soul and god as expounded by the Vedanta school. Most elite temples follow what is known as Agamic rituals which are highly Sanskritzed rituals along with usage of Tamil hymns by specialized singers known as Ootuvar. Most other Sri Lankan Hindus follow what is commonly known as folk Hinduism without the baggage of philosophical school of thought They usually worship a village, clan or tribal deity within or outside the accepted pantheon of Hindu deities. 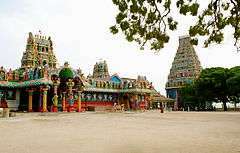 Some local Deities are Kannaki, Mariamman, Draupadi, Ayyanar, Vairavar and worship of weapons such as Vel or the lance. They might worship it in a formal temple structure, forest grove or an open plain. They might or might not use the help of Brahmin priests. Localized rituals are employed but share common features across India, specifically South India. Some such rituals are Kavadi Attam or penance dancing, Tee Midi or fire walking , trance due to possession by local gods and animal sacrifices to appease local gods or spirits. Religion is compulsory subject in Sri Lankan schools and Hindu students can choose from either Hinduism or Saiva Siddhanta as a compulsory subject from Grade 1 to Grade 11. Sri Lankan Tamils mostly study Saiva Siddhanta while upcountry Tamils mostly study Hinduism. As a reaction as well as effort to arrest the conversion efforts of missionaries there arose many religious reformers that wanted to modify the existing Hindu practices to better able to stand up to western Christian critique. Few of them are prominent, such as Arumuka Navalar and Vipulananda Adigal. Amongst religious teachers or Gurus, Kaddai Swamy and Yogaswami stands out whose direct sannyasin sishya, Satguru Sivaya Subramuniyaswami, founded Saiva Siddhanta Church in Hawaii in the United States. As most prominent Hindu places of worship were concentrated on the coastal areas, all were destroyed by the Portuguese zealots during the post 1505 AD colonial era. 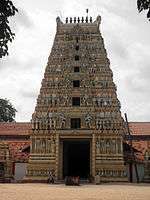 Hindus in Sri Lanka believe that the Island once had 5 prominent temples dedicated to Lord Shiva. All were destroyed by the Portuguese during the colonial period. Of these apart from the temple in the South all have been rebuilt during the British or post independent era. Apart from these temples there are other prominent temples such as the newly constructed Ponnabalvaneswarm temple in the capital Colombo, the ancient Nainativu Nagapooshani Amman Kovil and the Nallur Kandaswamy Kovil constructed in Jaffna during the medieval period that are still important to current day Hindus. There are also places of worship and temples that are sacred to both Buddhists and Hindus in Sri Lanka. 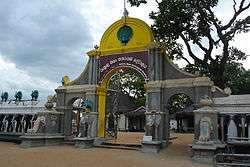 The prominent one is Katirkamam also known as Kataragama temple dedicated to Lord Murukan or Skanda. Also Adam's Peak a mountain top that is also known as Sri Pada by the Buddhists and Sivanolipada Malai by the Hindus. vinaayagar kovil,Mullaiyalvalai Kaaddu, Mullaitivu, Sri Lanka. In the long term, as a dwindling minority, the future could appear uncertain for the survival of a community after almost 2,500 years of varying degrees of presence in Sri Lanka. The Tamils of recent Indian origin, in the plantations, which constitute over half of the Hindu population in Sri Lanka continues to exist, unaffected of the consequences of the civil war. The prohibition of naval travel between Sri Lanka and India has isolated Sri Lankan Hindus from their Indian neighbours. According to the 1981 census, there were 2,297,800 Hindus in Sri Lanka. The 2012 census reported 2,554,606 Hindus in all of Sri Lanka. This was 12.6% down from 15.48% in 1981 largely on account of immigration. It should be noted that 20,000 people died during the 2004 Tsunami in LTTE held areas alone. In 1981 close to 85% of all Tamils were Hindus. Hindus constitute the overwhelming majority of Tamils in Sri Lanka. However, in the district of Mannar, Christians slightly outnumber Hindus. Highest proportion of Hindus are found in Eastern Sri Lanka (Close to 91% of all Tamils, with 92% in Amparai and Batticaloa and 87% in Trincomallee). 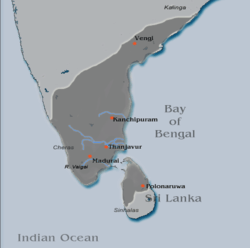 In the Central Province also the proportion of Hindus is more than 90% of the Tamil population. (91% each in Matale and Nuwara Eliya and 88% in Kandy). In Uva province the proportion of Hindus is 91.3% of the Tamil population. However, in 1981 93.15% of Uva Tamils were Hindu. In Northern Province 84% of all Tamils were Hindus (90% in Vavuniya, 87% in Jaffna and Mullaitivu and 42% in Mannar). The below table compares 2001 census with the 1981 census. ↑ According to several authors they may have been a race of the Dravidians. ↑ Walking to Kataragama, Sunil Goonasekera, International Centre for Ethnic Studies, 2007, p. 520. ↑ The Book of Shiva, Namita Gokhale, Penguin Books India, 2009, p. 104. ↑ Meeadhu, Kalabooshanam (13 June 2008). "Nainativu Nagapooshani Chariot festival". Retrieved 18 January 2011. ↑ Holt 2011, p. 73-74. ↑ Laura Smid (2003). South Asian folklore: an encyclopedia : Afghanistan, Bangladesh, India, Pakistan, Sri Lanka. Great Britain: Routledge. 429. ↑ Chelvadurai Manogaran (1987). Ethnic conflict and reconciliation in Sri Lanka . United States of America: University of Hawaii Press. 21. ↑ Asian Religions in British Columbia, UBC Press 2011, p. 125.